VRconnection uses an innovative and patent pending approach to working with your transactions. In a nutshell, the system is designed to anticipate what is to happen next with each transaction you are working with, stepping you through the process with incredible ease. 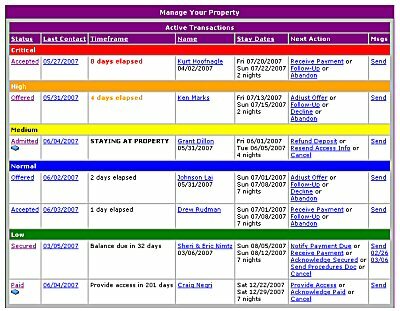 First, it categorizes all of your active transactions into color coded 'priorities', ranging from Low to Critical. It does this categorization based on timing parameters on when things need your attention. Critical items need your immediate attention, while low priority ones can usually be ignored. In this way, VRconnection allows you to focus on only the tasks that need your attention, while allowing you to ignore those that are in a wait stage. Coupled with VRconnection's built in e-mail reminders, you should never again need to look over each and every transaction to get an assessment of what you need to do. This can dramatically cut down on the busywork of managing your inquiries and guests. In addition to uniquely prioritizing your pending transactions, VRconnection employs another innovative approach to moving your reservations along to completion. For each step that a transaction is on, the system will offer a list of the most common 'Next Actions' that can be taken (see image to left). By anticipating the most common next steps in the life-cycle of a reservation, VRconnection once again helps to narrow your focus and make you much more efficient at working through your transactions. Continuing with our previous example, after a reservation offer has been accepted by a prospective guest, VRconnection will mark the transaction as 'Accepted' and awaiting deposit payment. Initially the transaction will be prioritized as Normal allowing time for the guest to mail in payment and paperwork. After 3 days, the system will escalate the transaction to Medium priority and after 7 days, the transaction is prioritized as Critical alerting you to the need to follow-up with the guest to ensure that payment is on its way. In this way, VRconnection is able to highlight which transactions require your attention and which ones do not. The system will even send you e-mail reminders when to do items become critical. Receive Payment is selected when you physically receive payment (and paperwork) for the reservation. This will open a new form to enter specific information about the payment received. Once that is entered, the reservation will be moved to the next step in the process. Follow-Up can be used to proactively contact the guest if a substantial amount of time has elapsed without receipt of payment. Abandon is used when follow-ups with the guest are unable to solicit proper payment for the accepted reservation. The reservation is then cancelled, the calendar cleared for the dates involved, and the transaction archived. Each reservation that is managed goes through similar priority escalations and has similar sets of 'Next Action' options, predetermined to be the most common courses of action when dealing with a reservation at a particular step. In addition to assisting you in ferrying along your transactions, the Active Transaction Queue (and its counterpart Archived Transaction Queue) also acts as a 'Control Panel' for access to all of your inquiries, reservations, and guest information. You can access all of the details of a transaction by clicking on the status of a transaction in the 'Status' column of the queue. This will bring up the 'Update Transaction' form for the transaction (see image to right). Much of this form will look very familiar, since a lot of the information displayed is configured during the offer a reservation procedure. However, some important additional information should be noted. First, the 'Status' section of the page shows you a historical accounting of the steps the reservation has taken and when these steps occurred. Also note the 'Messages' section of the form. Here you will find a complete accounting of all e-mail communications between you and the guest. Whenever you utilize the built-in e-mail editor to send a message to one of your guests, VRconnection will store that e-mail with the transaction. If you receive an e-mail reply from the guest, that reply will also be stored with the transaction. In this way, VRconnection will auto-file all of your e-mail exchanges so that you can easily revisit what has been communicated between you in a guest. No more manually filing e-mails into a Byzantine folder structure in your e-mail filing cabinet -- VRconnection handles it all for you automatically. 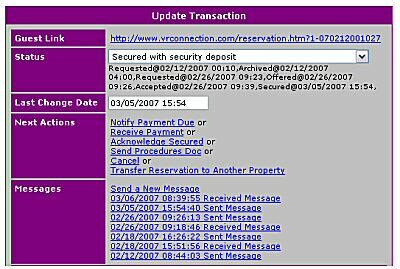 While most information pertaining to a transaction is managed and maintained through the next action progression of the reservation, the update transaction form can be used to make manual updates. Simply make your changes and click the 'Update Transaction' button at the bottom of the form. This approach can be used when a transaction goes a bit awry and none of the recommended next action options is the right fit. Most of the time, manually changing the 'Status' of a reservation will put the transaction back on track. Up until this point, we have only discussed inquiries and reservations that have originated from VRconnection's marketing efforts. VRconnection also supports inquiries and reservations that originate elsewhere or that occurred prior to enlisting our service. We strongly recommended that you take a broader approach to advertising your property - the more exposure you get, the more bookings should follow. For example, you may advertise your property in a local paper or receive inquiries via phone. In these instances, you can manually create reservation transactions via the 'Make an Offer' and 'Book a Reservation' links on the Manage Listing page. Use these procedures to offer reservations to inquiries that come via phone or to add property bookings to the system and fill out your calendar and active transaction queue as needed. Once a reservation is manually added to the system, it will be managed by VRconnection in the same manner as those reservations initiated by the system. If you receive e-mail inquiries for reservations from other listing services, VRconnection can act as a 'clearing house' to automatically process all such inquiries. For more information on this advanced functionality, click here. The system can automatically process inquiries from over 50 listing services and new ones are being added on a weekly basis. If you like what you see so far, click here to list and manage your property with VRconnection. Otherwise, let's continue the tutorial with receiving payments.